This has been a horrible year and I’m so thrilled that it’s almost over. There were way too many deaths, accidents, injuries, hopefully curable diseases/syndromes, and heartbreaks to last a lifetime. Not to mention termites. Never again do I wish to experience this sort of bad luck again. And especially not within a 12 month span. My family has endured so much and we’re still standing. Sort of. Sorry to start my first entry in many months on a bad note, but it had to be said. There has been some good happen this year. Namely I got a much deserved raise at work, Steve decided to go to law school and took the LSAT (we get the scores in a couple of weeks), and… umm… we have our own place. Seriously, finding those 3 was like pulling teeth. Anyhow, tonight I decided to pull my Christmas ornament box out and finish the project that I started last year. Last year I had wrapped all the balls with yarn. 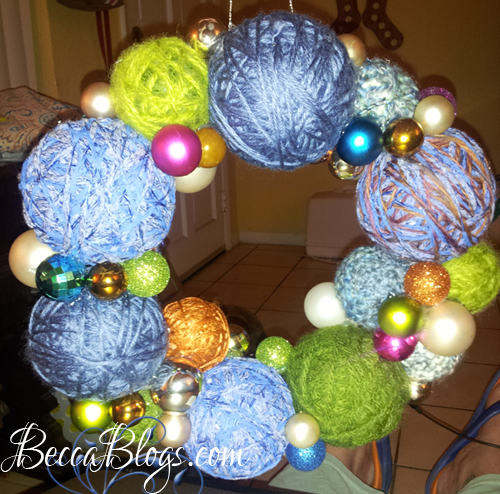 I thought there was a color scheme, but it turns out to be blues and greens and other random colors of leftover yarn. Tonight I glued them all down and stuck the ornaments around. I also burned the hell out of my arms and hands in several places. And Lola learned what a hot glue gun was… with her nose. So without further ado, my adorable wreath! As far as law school is concerned, we aren’t 100% certain where we will be other then not in Miami. With me supporting us at least his first year, this over the top expensive city just isn’t possible.